Credit: © Bettmann/CORBIS. 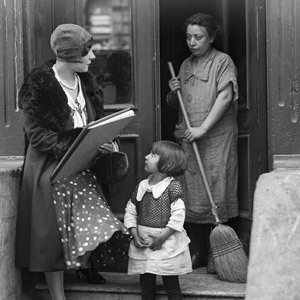 A Census taker obtains the necessary data from a woman in New York City on April 2, 1930. The U.S. Census Bureau will survey Americans this year in a way that’s unlike any other in its history. After centuries of using the postal service and in-person visits, the agency will contact people by email or text, pushing them to respond online. And if people do not respond, they might be counted using information from a government or commercial database. The unusual approach, which might begin as early as this summer, aims to target 192,500 households in Washington, D.C., and suburban Montgomery County, and is an experiment to test ways of conducting the 2020 Census. Faced with rising costs and increasingly hard-to-reach respondents, the bureau has promised fundamental change to the paper-based census model that has prevailed since the time when horse and buggy was the primary mode of transportation. The test census, according to a notice in the Federal Register, will try a variety of techniques and technologies intended to lower costs and maintain quality. One important goal is to maximize the number of people who respond on their own. That’s because following up on households that do not return their questionnaires—be it by sending a census-taker to the door or asking neighbors for information—is the single most expensive operation of the census. So, to make it easier for people to participate, the Census Bureau will invite some people to pre-register their contact information, and specify whether they prefer to be reached by email or text. The online response option will be presented first, though paper questionnaires and a telephone response option also will be available. The questionnaire will be a much shorter version of the bureau’s American Community Survey, a sample survey of households that provides updated national, state and local demographic data each year. The American Community Survey has had an online response option since last year for most households that receive it. About half (55%) of those who respond on their own have done so online, according to the Census Bureau. Bureau officials assume that up to 50,000 households (26%) in this experiment won’t turn in their questionnaires, close to the share that did not respond in 2010. What the agency proposes to do next is unprecedented: Government or commercial databases may then be used to figure out which of those non-responding addresses are vacant, which is less expensive than sending a census-taker to the door. Databases may also be employed to provide details about people living in some occupied homes who did not send back their questionnaires. When census-takers are sent to knock on doors, the bureau will try to save money during the test by using updated guidance on where to go and what to try. For example, if past experience shows no one is home in the morning at a particular address, census-takers would try to go at other times. In previous censuses, census-takers were given a list of addresses, and general instructions to make six visits before giving up and seeking information from neighbors. The bureau also will try new technology in the door-to-door phase, something called BYOD—Bring Your Own Device. In the 2010 Census, the agency planned to give census-takers proprietary government handheld devices for collecting information, but had to abandon the idea because the devices did not work properly. In the test, it will experiment with letting some census-takers collect information using their own iPhones, iPads or other devices, employing new software the bureau is developing. The Census Bureau, which has set a Feb. 24 deadline for comments on its proposal, hopes to submit formal plans to the Office of Management and Budget by early April and begin contacting households in early June. The tentative schedule calls for sending repeated reminders and extra questionnaires to households that do not reply, and to begin visiting the non-responding households in mid-August. The Census Bureau’s problems in obtaining an adequate response from the public are a larger-scale version of issues afflicting most survey research organizations. The growing public reluctance to answer surveys raises costs and carries a risk that those who do respond will not be representative of the general public. For the bureau, the cost of counting each household in the census was more than 500% higher in 2010 ($98 per address) than in 1970 ($16). Research over the years has found that certain groups, including immigrants, some racial minorities and the poor, are less likely to participate in the national count.